James Phillips began his training in Kyokushin-kai Karate in 1973. An accomplished instructor with 24 years experience in the martial arts, he is now regarded as one of Australia's foremost karateka. Born 25th May, 1956, Jim retired from tournament fighting in 1990. His achievements include twice National Lightweight Champion (fighting at 69kg), National Middleweight Champion (at 80kg) and also competing in the Heavyweight division of the Grand Championships. In 1979 he represented Australia in the World Championships in Japan. He has also won the State full-contact and non-contact titles numerous times. Jim has travelled to Honbu, Tokyo, Japan to train under the late Sosai Mas Oyama and has also trained under many of his most prized fighters. He is also one of the few Australians to complete the 50-Man Kumite. Jim was affiliated with Kancho Matsui, representing him in Australia in his capacity of Branch Chief and Australian Vice-Chairman of the IKO(1), until late 2000, when he decided to join the growing independent movement, and left the IKO(1). He formed the South Pacific federation with the also newly independent New Zealand group led by Shihan Kevin Pepperell and also with Sensei George Kolovos in Melbourne. They have since held a couple of successful tournaments already. He has also since been awarded his 6th dan by this organisation. Jim takes the opportunity to travel as often as he can, always seeking to complement his martial arts knowledge for the benefit of his students. He endeavours to visit Honbu or sponsor visits from Japanese instructors regularly to keep the dojo abreast of the latest developments in Kyokushin-kai. 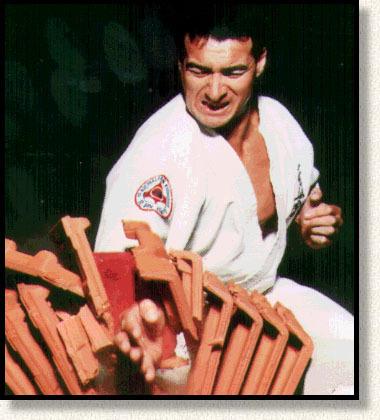 Over the years he has worked closely with Shihan Bobby Lowe, Hawaii and continues to do so, particularly in the study of self defence techniques. Jim is also keen to foster relationships with other martial art styles outside Kyokushinkai, believing that the transfer of knowledge can only benefit all martial arts. The James Phillips Martial Arts centre is a full-time Kyokushin-kai Karate dojo operating in Rosebery,NSW , Sydney. It is one of the few dojo to offer distinct classes for children, beginners, or advanced adults as well as private lessons and stretching and yoga classes. As well as an extensive inventory of training equipment (bags, pads, gloves etc), the dojo is equipped with a weight-training area and accommodation for uchi-deshi.